By now you must have heard of socca, right? 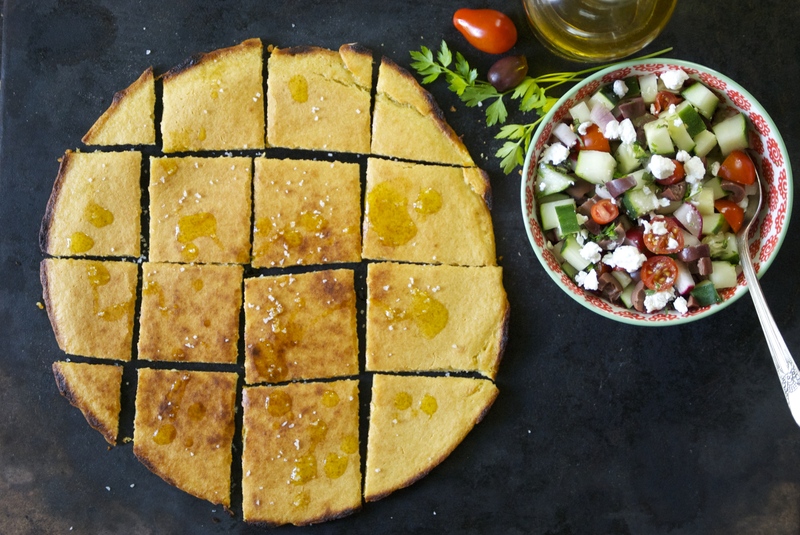 Well if you haven’t, it’s simply garbanzo bean (chickpea) flour made into a pancake or flatbread. It’s a nice gluten-free alternative that tastes fantastic– I bet I eat it about once a week. Chickpeas are a great source of protein with a wonderful flavor. 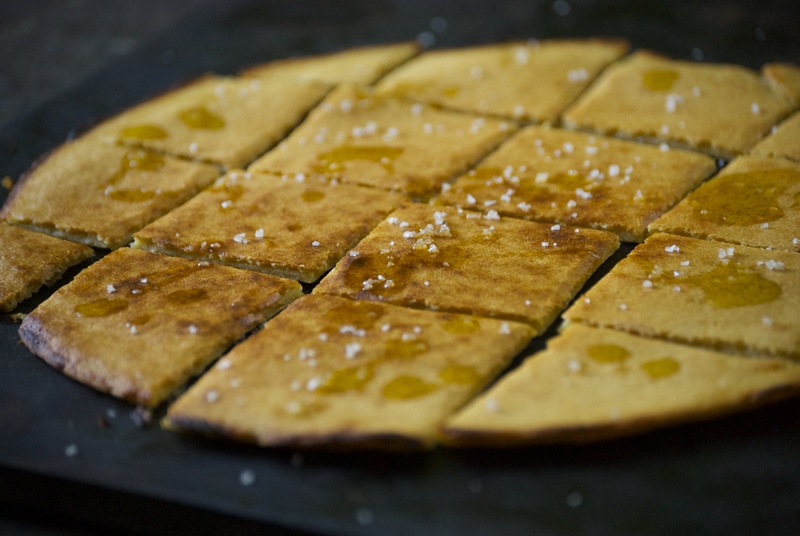 A while back I posted a different recipe for socca. It’s still one of my favorites– especially with the sweet potatoes, kale, italian sausage, and creamy buttermilk dressing. That one is more of a pancake, while this most-certainly is not. This version is thinner and crispier, with the characteristics of a flatbread. I like to eat this one as a piece of “bread” piled high with delicious toppings– usually vegetables. Today I made a lovely little greek vegetable ensemble that works so well with the socca. Other times, fresh corn, tomatoes, scallions, and cotija cheese serve the purpose. You get the idea. Use whatever you have around the house/garden and let the socca be the instrument to get it into your mouth. It’s nice in that the ingredient list is small to make socca and the cooking time is barely five minutes. The longest part of this process is waiting about 30 minutes for the flour to fully absorb the water. Believe me, I’ve rushed this part before, and it’s not a huge deal. 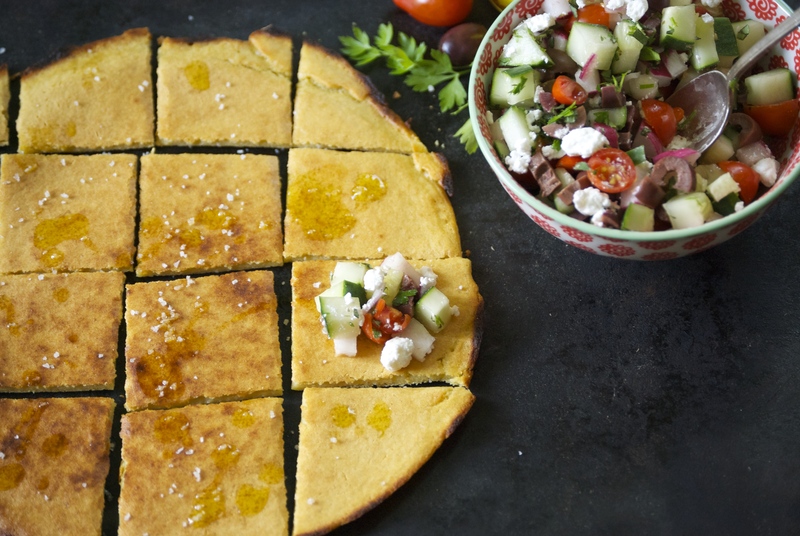 But, if you can wait– you’ll end up with perfect, crispy-edged flatbread that is sturdy enough for toppings. Rather than frying the flatbread, you cook it under the broiler– a technique that my friend, Angharad (another fellow socca lover), introduced me to. It works really slick. All sides get browned and crispy. This meal is perfect to whip up on a moments notice and you’ll love it. Trust me. 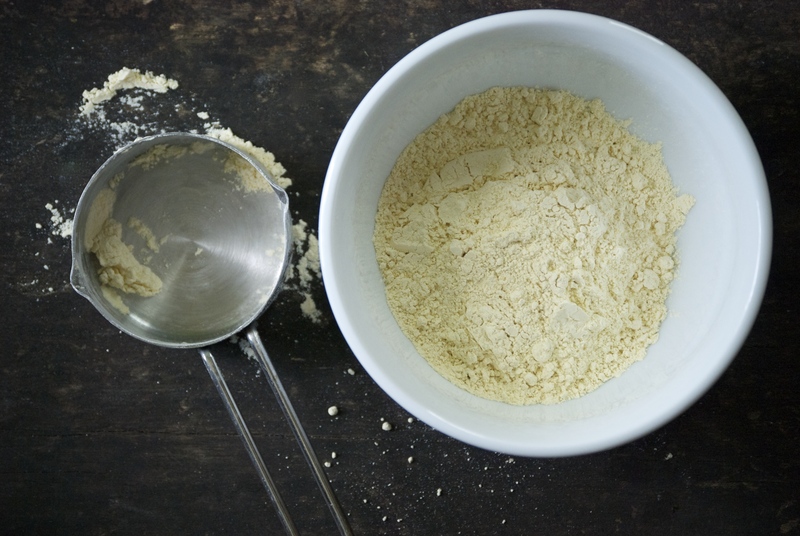 In a medium-sized bowl, whisk together the chickpea flour, water, salt, and olive oil. Let rest for about 30 minutes. 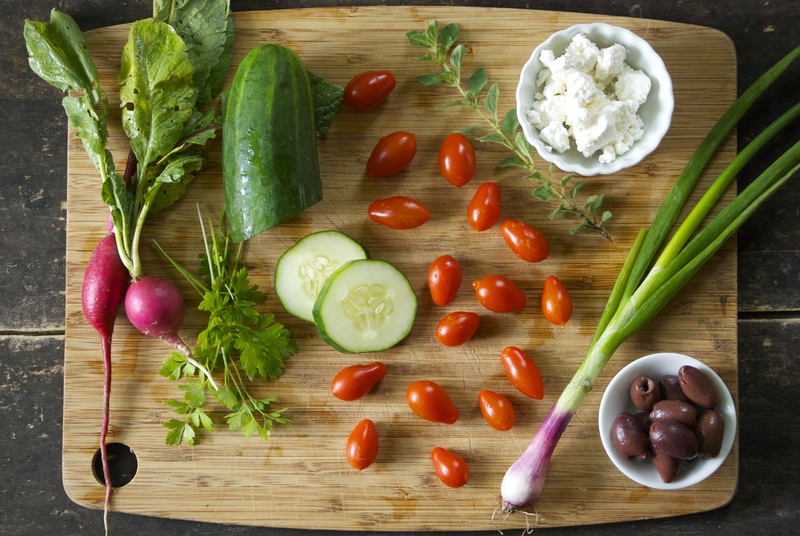 Meanwhile, combine the ingredients for the Greek vegetable salsa in a medium-sized bowl. Set aside. After the batter has rested for 30 minutes, place the oven rack in the position closest to the broiler. Heat a cast-iron skillet under the broiler for 5 minutes (this helps cook the bottom of the socca quickly). Remove from the oven an add enough olive oil to coat the pan when swirled. 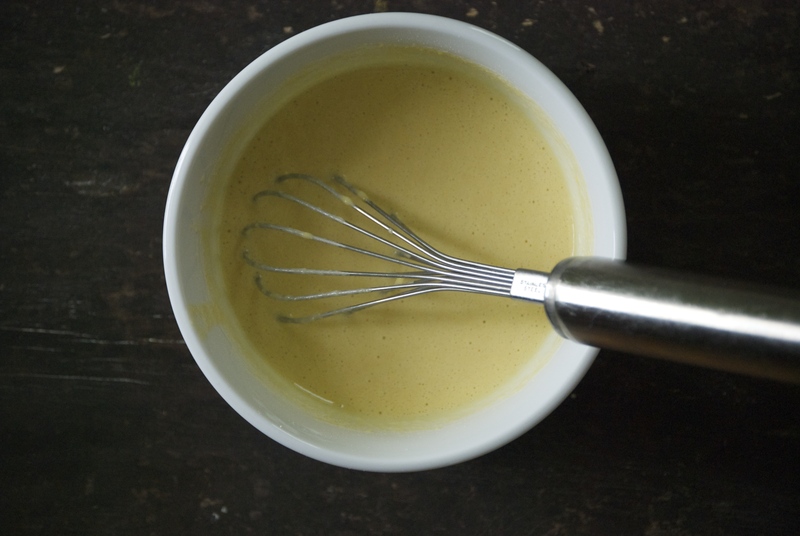 Then add the batter and swirl around until the bottom of the pan is evenly coated. Place under the broiler and cook until the top is a deep golden brown, about 5-7 minutes. You will probably have to move the pan around once or twice during this time, to bake evenly. Remove from oven and use a spatula to carefully remove from the pan. Drizzle with olive oil and sea salt. Cut. 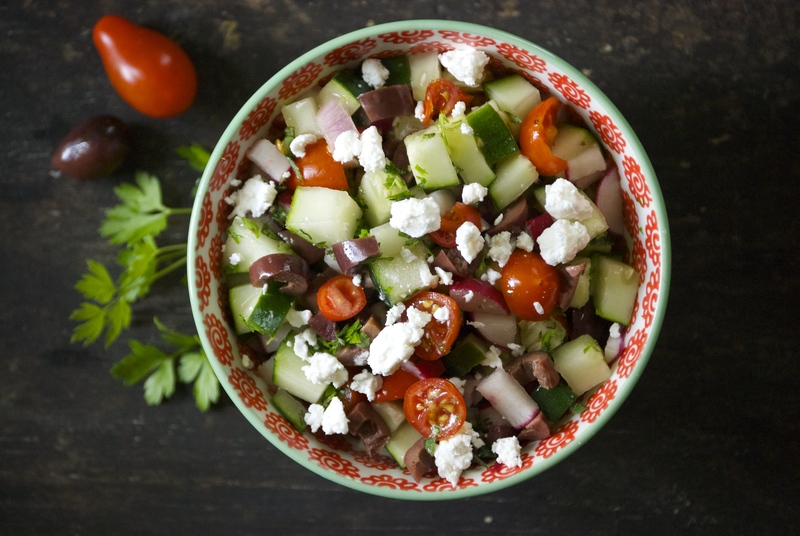 And serve with the greek vegetable salsa, or any other topping you would like. Or eat it plain– it’s all delicious! Enjoy! Thanks for stopping by Relishing It! Have a great day. I can not wait to try this! We are largely wheatfree over here and my children will be thrilled!! Ugh, I’ve heard about it so many times and have not tried it yet! (I’m annoyed with myself) Beautiful images too! i love socca. this is a great way to eat it!